Jeff has worked with The University of Exeter Medical School, Plymouth University Peninsula School of Medicine and Dentistry and The University of Bristol Medical School to deliver medical humanities workshops, clinical skills training and communications skills courses. 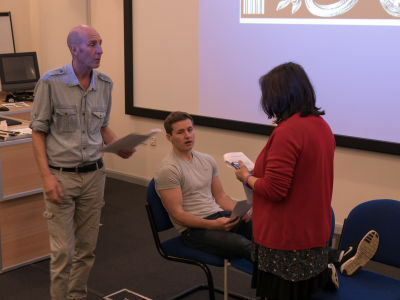 His popular drama based courses ‘Are You Having a Laugh?’ and ‘Improv Your Practice’ have helped medical and dental students to develop their communications and presentation skills, increase self confidence, develop teamworking abilities and become more creative in their thinking whilst having a lot of fun! Red Earth Consultancy Business mediation and organisational change consultancy.